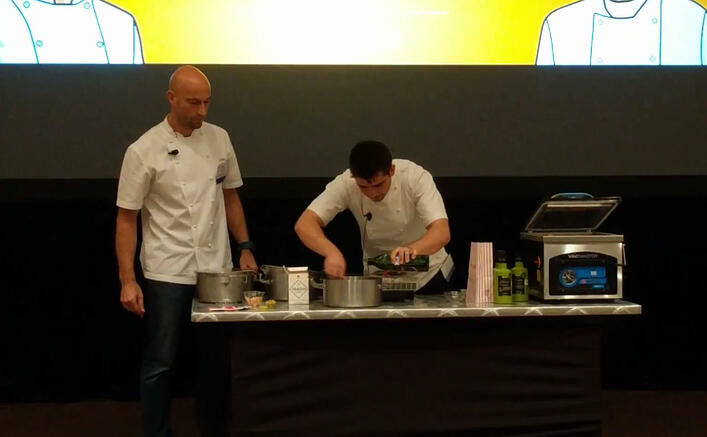 Day 3 of the Olive Oil Conference started off very seriously and ended with a literal bang with a cooking demontration by Olly Rouse and Joe Gould of Lainston House. 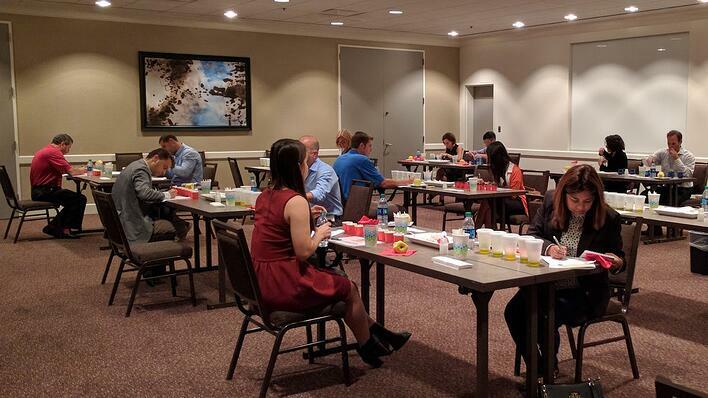 For many of us at the conference, our day began with the North American Taster’s Challenge. Participants put their skills to the test. Tasters assessed olive oils to detect faults, rate for intensity, and identify olive varieties. Last year's champion Hayley Stevens tied for first place with Katalin Karpati, Business Development Director at Sovena USA. Rafael Muela, of Mueloliva, presented on olive oil megatrends. His interesting presentation was perfect for the audience -- covering topics such as production, consumption and marketing trends. Not only was Rafael's expertise evident, he also showed his great passion for olive oil as a farmer, producer, marketer and retailer. Eryn Balch, Executive Vice President of the North American Olive Oil Association, presented on olive oil value. Her talk presented an interesting way of looking at olive oil that would be especially relevant to food service or consumers looking to lower their costs when concerned with olive oil. Rick Cummisford, Director of Quality Control at Columbus Vegetable Oils, presented on innovative uses of olive oil. His fascinating talk expanded the minds of conference attendees on the possibilities of olive oil that go beyond typical applications. The event ended on a high note with Chefs Olly Rouse and Joe Gould of Lainston House who presented an olive oil sensory experience. The chefs showed their love of olive oil with their creative presentation of new olive oil cooking techniques and applications that delighted the audience. Stay tuned for a video and photo recap! Overall, the conference was filled with education, information, great food and entertainment. Thank you to all who attended The Olive Oil Conference! We look forward to seeing you next year.